Located in the tallest high rise in Belgrade, Genex tower, also known as Western Gate to the city, was designed in 1978 in the brutalist style. This 68 square meters (732 sq ft) apartment, located on the top, 30th floor, the highest residential residence in Belgrade, offers you the best and unique view of Belgrade. Your view will spread from Kalemegdan and old town to all significant landmarks of Belgrade. Fully renovated and decorated in a modern, stunning dark wenge wood with unique minimalist style, the place, in addition, offers HDTV and free WI-FI. Our place is good for couples, couples with kids, solo adventurers and business travellers. The apartment consists of hallway, one bedroom, open concept living and dining room (32 square meters/ 345 sq ft), kitchen, one and a half bathroom. There is also free parking space just outside the building. The check-in and check-out times are flexible if there are no other reservations on the days of your arrival or departure. Pick up or drop off from and to the Airport is available for additional cost of $15. You will have umbrella at your disposal, just in case, ironing board and if you have a need to wash your clothes ask us to provide you with service for little extra. Our location is well connected with other parts of the city, with numerous public transportation lines from nearby bus stations - you can take bus 65 and you'll be in the city center in 12 minutes. Or if you are interested in Zemun and historical Gardos tower, hop into bus lines 17, 73, 83. If you have any questions about getting around the city, I can help anytime. If you are coming from the airport, bus line A1 is the fastest way to come to Genex tower. If you are coming by car, there is a lot of free parking space just outside the building. And the Nikola Tesla Airport is just 12km away. Hosted by Divna and Milos We are a married couple who live in the same building and at the same time enjoy our cottage on the Danube River near Belgrade that we built with love, same as our home in the city which we would like to share with you! We also like to travel, explore different cultures and are excited to meet travellers. Our home reflects our design sense and devotion to detail. Our light-filled space includes both vintage and modern elements for our guests to enjoy. We put a lot into making our guests feel welcome knowing that you will feel at home during your stay. The place is located in New Belgrade, near the business centres like Sava Centar, Belgrade Arena and is well connected to other parts of the city - downtown, Zemun, Kalemegdan, city rivers, Sava and Danube, etc… Grocery shopping is conveniently located and there is many nearby restaurants and other places to eat. The best view of downtown Belgrade, new bridge, Kalemegdan fortress and all landmarks of Belgrade from the highest residential unit in the entire city! It is also close to the main highway going through the city and it is well connected to all parts of the city. At your disposal: hair dryer, shampoo, body-wash and a soap. 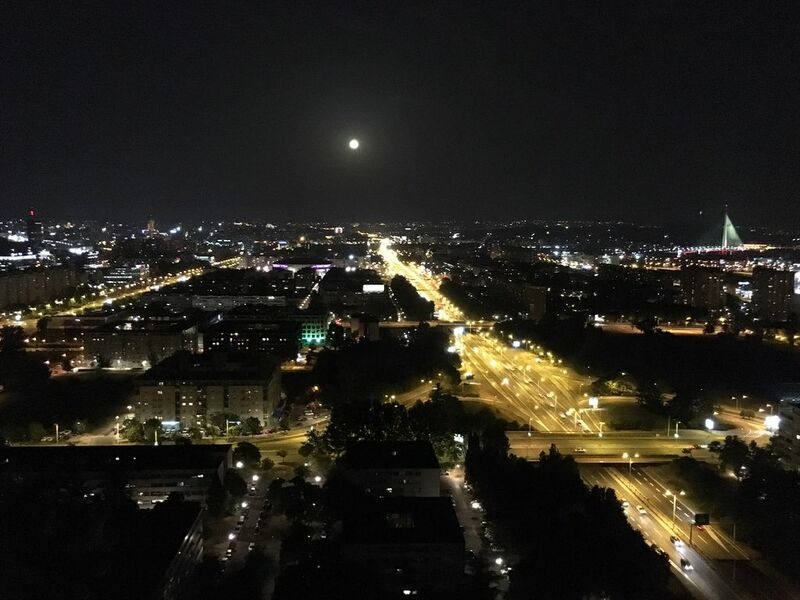 Located on the top, 30th floor, the highest residence in Belgrade, offers you the best and unique view of Belgrade that spreads from Kalemegdan and old town to all significant landmarks of the city. Linens include bed sheets, pillows and pillow cases. Wi-Fi (wireless internet), high-speed, throughout the apartment! A full kitchen contains at least a refrigerator, stovetop, oven and sink. The apartment is located on the top floor of the Genex building (Western Gate) with an awesome view of the city. The apartment itself is well maintained and clearly newly renovated. It comes with all of the amenities one would expect and can comfortably sleep 4. The owner is very gracious and was extremely helpful in arranging transport to and from the airport. The city is easily accessible from this new Belgrade location and the view makes your stay more special. Check it out. Bojan and his family were ideal guests. They left apartment in the condition they found it. Hope to see them again, they are always welcome!